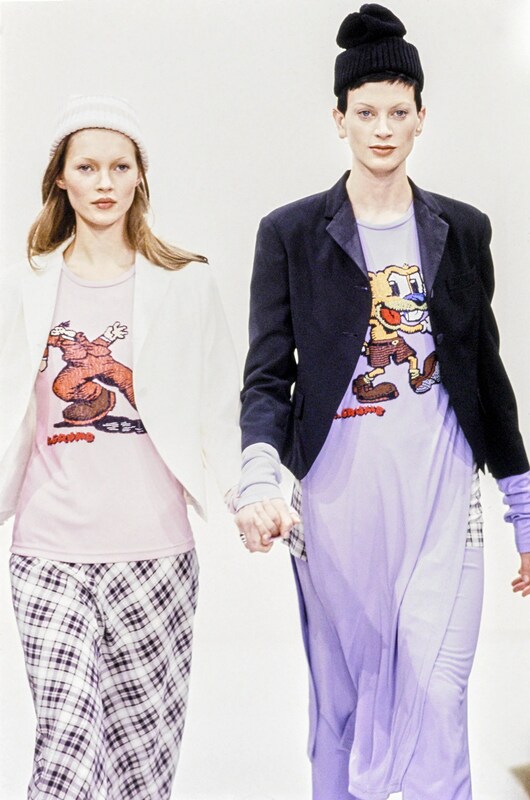 Marc Jacobs’ Spring/Summer 1993 ‘grunge’ collection for Perry Ellis was a succès de scandale, a landmark collection that got him fired and continues to provoke debate. (See my earlier Marc Jacobs for Perry Ellis post here.) 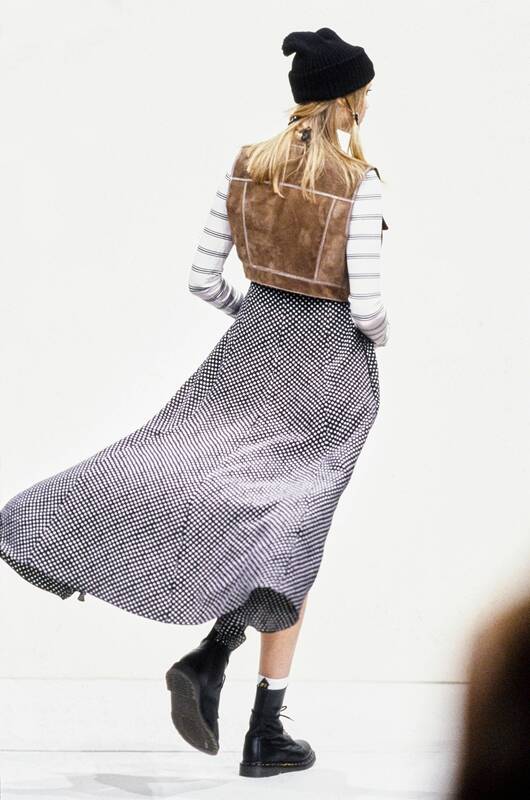 Shown in November 1992, the collection was inspired by the music of Seattle bands like Nirvana and the layered, mismatched, thrift-store vintage look associated with the grunge scene in the Pacific Northwest. Kurt Cobain performs in a vintage floral print, Amherst, 1990. Image: Malibu PR Gal. 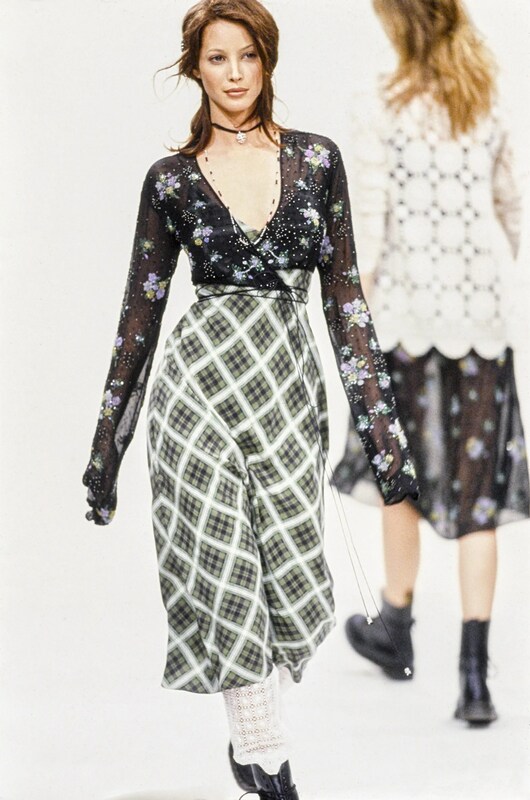 At the time, Jacobs described his interpretation of grunge as “a hippied romantic version of punk.” The collection referenced grunge style with mixed floral and tartan prints and thermal layers, but translated them for the runway through play with luxurious materials: the flannels and thermals were sand-washed Italian silk and cashmere, worn with Doc Martens and specially-made duchesse satin Converse and Birkenstocks. Christy Turlington in Perry Ellis Spring 1993 collection, designed by Marc Jacobs. Image: Vogue Runway. Kristen McMenamy and Kate Moss model Marc Jacobs’ Spring 1993 grunge collection for Perry Ellis. Image: Vogue Runway. Perry Ellis SS 1993 by Marc Jacobs. Models: Kristen McMenamy and Kate Moss. Image: Couture Culture. Update: Vogue Runway has posted this collection in its entirety here. “Grunge & Glory.” Vogue, December 1992. On right: Kristen McMenamy in Perry Ellis by Marc Jacobs. Photo: Steven Meisel. Fashion editor: Grace Coddington. Image: Rag Pony. 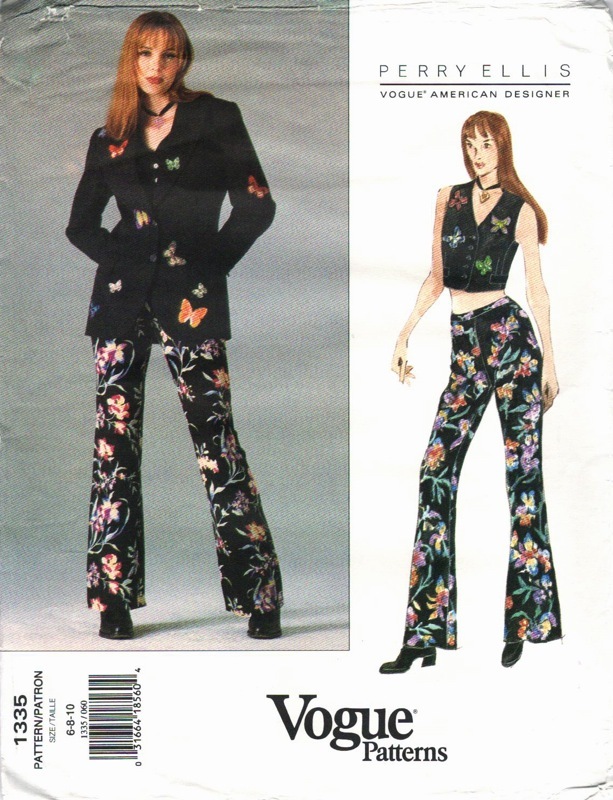 Vogue 1335 by Marc Jacobs for Perry Ellis (1994) Jacket, vest, and pants. Here’s the envelope description: Misses’ jacket, vest & pants. 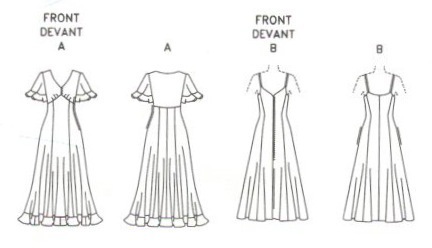 Semi-fitted, lined, below hip jacket has notched collar, shoulder pads, flaps, upper and lower welt pockets, side back seams and long, two-piece sleeves with mock vent and button trim. Semi-fitted, lined, above waist vest has side panels, no side seams and welts. Both have purchased appliques. Bell-bottom pants have contour waistband and back zipper. Perry Ellis SS 1993 by Marc Jacobs. Model: Nadja Auermann. Image: Vogue Runway. Jacket, vest, and pants by Marc Jacobs for Perry Ellis; DKNY high-tops. Detroit Free Press, March 1993. Photo: George Waldman. Vogue 1304 by Marc Jacobs for Perry Ellis (1994) Image: PatternVault shop. Perry Ellis SS 1993 by Marc Jacobs. Model: Helena Christensen. Image: Vogue Runway. 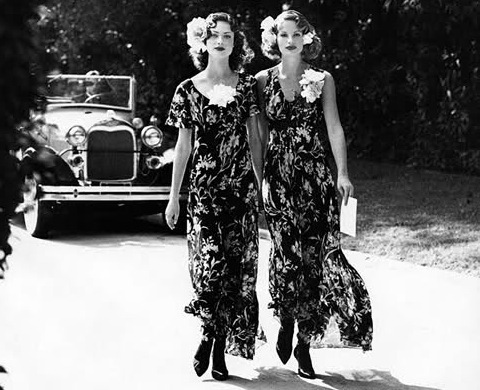 “Garden Party.” Harper’s Bazaar, February 1993. Photo: Patrick Demarchelier. Image: noirfacade. “Traveling Light.” Vogue, April 1993. Photo: Bruce Weber. Image: Herringbone and Houndstooth. “Beauty and the Beach,” Vogue, July 1993. Photo: Ellen von Unwerth. Fashion editor: Grace Coddington. Image: Herringbone and Houndstooth. It’s this effect of visual noise, of dissonance, achieved by Jacob’s high fashion take on street style that makes the Perry Ellis grunge collection so influential. There’s also something very ’90s-postmodern about reverse-faux—luxury materials mimicking their more affordable counterparts. Yet, according to Voguepedia, the grunge collection was never produced, making Vogue’s Perry Ellis patterns all the more interesting to lovers of ’90s fashion.